1. What are the MK 19's five major groups (field strip groups)? a. Receiver assembly, top cover assembly, sear assembly, bolt assembly, and feed slide assembly. b. 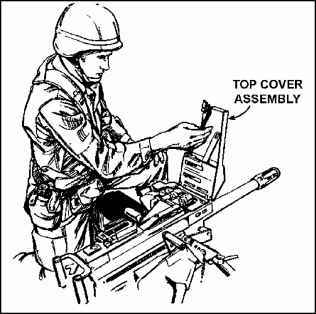 Top cover assembly, receiver assembly, barrel, sear assembly and feed tray, and bolt and backplate assembly. c. Receiver assembly, feed slide assembly and feed tray, top cover assembly, sear assembly, and bolt and backplate assembly. d. Sear assembly with chargers, receiver assembly, feed tray assembly, top cover assembly, bolt and backplate assembly. 2. Where on the weapon is the safety located? a. On the right side of the receiver assembly. b. On the left side of the receiver assembly. c. On top of the receiver assembly. d. On the sear assembly at the bottom rear of the receiver assembly. 3. In a nonfiring situation to clear the weapon, in which order are the steps below taken? 1. Ensure that the safety switch is in the S (SAFE) position, and the bolt is forward. Open the top cover by rotating the top cover latch counterclockwise. Lift the cover. 2. Return the bolt to the full forward position. Rotate the charger handles upward. 3. Inspect the feed tray and extractors on the top of the bolt to make sure no round is in the "pickup" position. 4. Unlock and pull the charging handles to the rear two to three inches. Inspect the face of the bolt and the chamber. 4. In which substance(s) should you never immerse the bolt and backplate assembly? 5. Under which conditions should you apply a generous second coat of lubricant when cleaning the weapon? 6. Under which conditions should you use a second coat of lubricant? 7. During reassembly, what is the first major group you should place back onto the weapon? b. Bolt and backplate assembly. 8. To ensure the primary and secondary drive levers align properly when you close the top cover of the weapon, in what positions should you place the feed slide assembly and bolt? 9. What is the maximum range of the weapon, in meters? 10. What is the maximum effective range of the weapon, in meters, for point targets? 11. What is the cyclic rate of fire for the weapon, in rounds per minute? 12. What is the main characteristic(s) of the MK 19? 13. Which mount(s) should you avoid attaching the weapon to? a. M3 tripod without the T&E mechanism. b. M3 tripod with the T&E mechanism. 14. How much armor plating, in inches, can a M430 HEDP round penetrate when fired at zero degrees obliquity? 15. Within how many meters must the 40-mm HE round impact to cause casualties to exposed enemy personnel? 16. What steps must you take to stop a runaway weapon? a. Release the trigger and step away from the weapon. b. Grab and twist the ammunition belt to break it off. c. Unlock and lower one charging handle while keeping control of the weapon. 17. When loading the weapon, place the female link end of the ammunition belt through the feed throat and draw the ammunition into the weapon feed area. 18. What term describes an interruption in the functioning cycle caused either by faulty action of the gun or by faulty ammunition? 19. What steps must you take to perform corrective action? a. Unload and clear the weapon. b. Inspect the weapon and ammunition to find the cause of the problem. c. Correct the problem, reload, and try to fire the weapon. 20. When you engage a target, how many rounds should you fire in each burst? 21. In which position(s) must you place both charger handles before the weapon will fire? c. To the rear and down. This is a guide for unit commanders to standardize and maintain MK 19 gunnery skills. It is a nonfiling, hands-on test given at the end of MK 19 training. The commander may authorize indoor testing if the facilities are available. Seven stations are used for the skill tests. The test is graded on a GO (pass) or NO-GO (fail) basis. a. Instructions for the Gunner's Examination. The following is a guide for giving gunners the skill test. "During the next_hours, you will take part in a performance-type examination to test your knowledge of the MK 19 machine gun. Stay with your assigned group during the entire examination. Initially, we will assign each group to a specific station. At each station, an assistant instructor will explain exactly what task or tasks you will perform. After beginning the task, if you do not know a step or steps, ask the assistant instructor for help. He will tell you how to perform the step. He will deduct the necessary points from your grade, and then you may continue to work. You must achieve a score of seventy percent in order to pass the test." (2) Organize the unit into seven equal groups that rotate from station to station until all individuals have been tested. Gunners must wear their helmet and load-bearing equipment (LBE) to be tested. Assign enough assistant instructors to each station to grade and critique each gunner's performance. For ease in marking, give score sheets to each grader and collect the sheets immediately after the test. (3) At the end of testing for each group, have each grader assemble the soldiers and give them a thorough five-minute critique. b. Testing Stations. There are seven stations for gunnery skills testing. All stations except one, six, and seven have intermediate training objectives. c. Scoring. For tasks at stations one, six, and seven, score the soldier GO if all steps are passed (P). Score the soldier NO-GO if any steps are failed (F). If the soldier fails any steps, show him what was done wrong and how to do it correctly. For stations two through five, score the soldier GO on a task if he receives no more than one intermediate training objective NO-GO. STATION ONE TASK: Identify the characteristics of the MK 19. CONDITIONS: In any environment, the gunner is given a complete tripod-mounted MK 19. STANDARDS: The gunner will know characteristics of the MK 19. 4. Maximum effective range for a point target. 5. Maximum effective range for an area target. 6. Cyclic rate of fire.